LOCALE Mark Edwards and Jory Bergman at Pub Republic, which is sleek and clean—the type of place that chains try to copy. The first time I look for Petaluma's Pub Republic, I just want to do a drive-by to see where it is. I drive straight through town. Apparently, it's not on Lakeville Street. The second time I look for Pub Republic, I consult Google maps. Still, I roll right out of town, having to turn out at a dairy and double back toward what ends up to be a newish shopping center on the edge of town. The problem was I had my eyes peeled for the low-slung hole-in-the-wall I'd imagined upon learning that a couple of hopeful locals had opened a pub with Brussels sprout tacos, a signature menu item that seemed to speak of gastropub aspirations. Come-on or not, I'm a big fan of the Brussels sprout, so I had to try them. Pub Republic fits so neatly in its space—built about seven years ago, with high ceilings, lots of glass, rustic wood details—you'd never guess that two restaurants have already inhabited it in seven years. I don't think I ever even noticed them on dozens of trips down this highway. But owners Jory Bergman and Mark Edwards aren't worried about the ghosts of restaurants past. "We did our due diligence," says Bergman. "We wanted to make sure that it wasn't the space or the location." The Novato-based couple researched the internet and spoke with former customers, vendors and chefs. Adjacent to several business parks, it's passed by 25,000 vehicles a day, and across the highway is a whole neighborhood in the 35-to-45-with-family demographic. All the time, new customers tell them, "I live just around the corner!" Bergman and Edwards recycled some elements of previous restaurants, like the booths and cushioned benches, and the stonework central to the bar. Big screens beam the games silently, while the soundtrack is contemporary rock. A dining area to the side provides a space for larger groups. In fact, with its geographically vague name, familiar layout and on-cue service, Pub Republic evinces something more like a well-planned chain restaurant than my original hole-in-the-wall guess. That blip on my corporate radar was no glitch. If Edwards winces a little at the mention, his partner laughs, it's because he doesn't talk much about his 23 years of experience in corporate restaurant management. But he's game to explain that he opened dozens of successful concept restaurants like Blackhawk Grille, Alcatraz Brewing and Napa Valley Grille—all in locations like the Mall of America, far from their namesakes. With Pub Republic, he's applying what he learned instead to a very local, community-oriented experience. "We see it, we feel it, we sample it, and we stay on top of it," says Edwards. They'll jump behind the bar, greet people and make sure that people know that the owners are on the floor, and in the community. Yes, the Brussels sprout tacos ($8) are the most talked-about item on the menu. During an anonymous drop-in, I found the tacos to be a surprisingly hearty, filling snack, meeting or exceeding expectations. Crunchy, fried sprouts provide the chewy, "meaty" base, although they could stand with a finer chop, so you're not gnawing on large pieces rumbling inside the flour tortilla (which isn't house-made, but that's a lot to ask). Better yet, if all the cheese was melted. An eight-ounce sirloin steak ($14) was attractively presented, with glistening peppercorn sauce, Parmesan scalloped potatoes and crisp sautéed green beans. The steak—grass-fed beef is the default option—was accidentally ordered "medium well" by a slip of my tongue, but was still just fine. A side of slender truffle Parmesan fries ($7) were nice and crispy, and mercifully light on the truffle oil. Yet more Brussels sprouts are tucked into the Guinness braised beef shepherd's pie ($14), served alongside the brick chicken ($17) and in the bacon hash with eggs and fingerling potatoes ($11). In season, some produce is sourced from nearby Green String Farm. Pistachio arugula salad ($8; $11) and crispy artichoke, green bean and watercress salad ($10) share the list with the customary caesar and mixed organic greens. Burger accessories include smoked gouda, shallots, chipotle sour cream and gluten-free buns. The short, smart wine list includes Rack and Riddle Blanc de Blancs from Hopland. Edwards keeps the Ballast Point Sculpin IPA flowing; other beers include Highway 101, Drake's, Lagunitas and gluten-free Widmer, too. 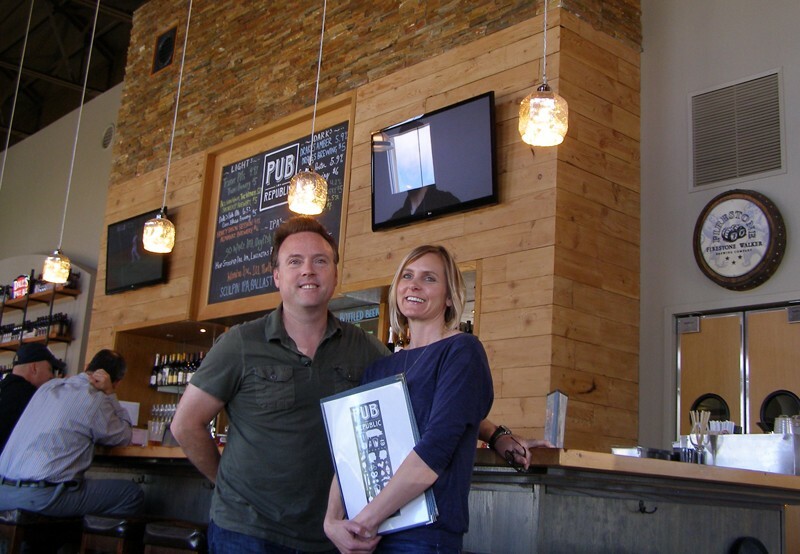 Bergman and Edwards built Pub Republic with the possibility of expansion in mind, but for now, they're happy to fill a niche in this corner of Petaluma, and are appreciative of the friendly, noncompetitive atmosphere in this town. Meanwhile, hidden behind a door, there's a faint outline of a crazy dancing skeleton under fresh paint, left over from the previous restaurant's decor. It's a sort of reminder, says Bergman, of the hard work they put in to transform the space—maybe even, a sort of talisman. One thing's for sure. They won't slack off with the ghost of restaurants past watching them. Pub Republic, 3120 Lakeville Hwy., Petaluma. 707.782.9090.